There’s always an occasion where personalised printed sashes can be used. This could include birthday parties, hen nights, school proms, exhibitions, product promotions, competitions. In reality the list is probably endless. With our printing process we print direct to the ribbon. We don’t need to produce a stencil or silk screen. Hence there is no problem if you only want one sash. Equally it also means that you could make a larger order and have different wording on each sash. Unlike several other personalising options, we don’t limit the number of words or number of characters that you can have on the sash. Just remember that there is an optimum viewing area when the sash is being worn. More words mean that we will have to reduce the size of the text to fit it all in the optimum space. The width of the sash is about 4 inches or 100 mm. We would therefore recommend either one line of large text. Alternatively if you want two lines then we would recommend putting the main message in slightly larger lettering on the top line. The second line would then be underneath in a small font size. The normal style of wearing the sash is over the wearer’s right shoulder. This is our default printing format. If you want to wear them over the other shoulder then please inform us when you order. This affects the way we print the message. We also have the option of putting your required text so that it is visible from behind as well as or instead of from the front. Equally you can have the text visible from both directions. 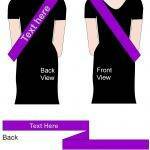 Again we need to know if you are planning to wear the sash in the non-standard position as this affects which text appears in which position when it is worn.